Jobs (and Gates) should "Put their money where the mouths are"
In the days since Steve Jobs' open letter basically denouncing DRM and calling for its abolition, we have heard from many of you that Jobs unfairly distances himself from the DRM problem and solution, laying the blame at the feet of the big four music companies. We wonder if he has forgotten that he is CEO of Pixar, part of the Disney Family. DRM is not just about music, increasingly it is movies and video that are protected by DRM, especially those selections purchased from iTMS. Instead of laying the responsibility for DRM with the music companies and calling on their customers to influence them, Jobs should ask music fans to join him in directly lobbying the Big Four to drop DRM. He should be joining with Bill Gates and hosting a summit on the issue with Big Media. Read more about Jobs (and Gates) should "Put their money where the mouths are"
A year ago I don't think that anyone could have imagined these two stunning announcements from the founders and titular heads of the worlds leading technology and digital music device companies. both Steve Jobs and Bill Gates have publicly derided DRM as an impossible mission to secure digital music files with "crippling" DRM. ZD Net ran a story on the UK Green Party position in opposition to Windows Vista. Vista requires more expensive and energy-hungry hardware, passing the cost on to consumers and the environment," Wall said. "This will also further exclude the poor from the latest technology, and impose burdensome costs on small and medium businesses who will be forced to enter another expensive upgrade cycle." And BoingBoing picked it up too. Check out Technorati for some other blog hits. Gates will be on the Daily Show tonight. Look for clips on video sharing sites and be sure to comment on them with links to BadVista.org and DefectiveByDesign.org. DefectiveByDesign members turned out today in New York City (despite the bitter cold!) to spread the message that Vista's DRM is a danger to computer users. We were joined by folks from the BadVista.org campaign who distributed free software to the guests lining up to attend the launch event. Engadget got their pictures up before we did. The Dawn of Vista DRM - On Monday we'll be turning out to share our "Wow Moments" with Bill Gates and his invited guests in NYC. We tried to get an invite to the events, but, alas, were denied access, so we'll be outside greeting guests as they arrive to the two swank events Microsoft has planned to pitch the Vista Upsell. First, we'll be at the star studded luncheon at Cipriani's on 42nd Street from noon. Sign up now to join us. "Wow starts now"? It's more like "Ow starts now", as consumers start to learn what they will lose by choosing Vista. DefectiveByDesign has been campaigning against DRM since last May. In that time, consumer and media awareness of the restitrictive technology has increased and consumers have largely turned against it. Even the music industry is contemplating dropping it. Yet even against the growing anti-drm chorus, Microsoft is launching the Vista Operating System which, aside from some new bells and whistles, and an increase in base hardware requirements, is largely a platform for DRM, designed to serve Big Media companies more than individual computer users. Vista represents a step backwards in users' freedom, it is an "upsell" not an "upgrade". While user's rights will be trammeled by the DRM and Treacherous Computing features of Vista, the collatoral damage will be environment as users are forced to abandon perfectly good hardware to meet the new requirements of Vista, generating tons of e-waste. Ars Technica reported last week on a Hollywood Exec's admission that DRM, for them, is not about piracy, rather about control over the way people interact with copyrighted works. BadVista.org has just announced an Amazon tagging campaign like the one we launched against DRMd products. Read the full post on BadVista.org, or got to go to Amazon and start tagging! Microsoft Getting Hammered: Vista secured by NSA Spies? Microsoft can't catch a break! A few weeks after the "launch" of the Zune, the Vista operating system caught some serious flack. Now, in a 1-2 punch, it has come to light that spies from the NSA helped to "secure" Vista and Steve Jobs unveiled the iPhone which could be described as the iPod Killer's Killer if the iPod Killer (The Zune) were not so pathetic. "Welcome to the Social" Microsoft! Read more about Microsoft Getting Hammered: Vista secured by NSA Spies? Alot is happening in the digital music realm these last few week.s We've heard news that Microsoft is abandoning PlaysForSure DRM to focus exclusively on their Zune DRM. EMI, meanwhile, has abandoned DRM in all new CDs which is great news, and they are also starting to offer mp3s with no drm. Including music by Norah Jones on Yahoo and eMusic. In December, the FSF launched the BadVista Campaign to raise awareness about the problems with Microsoft Vista and promote Free software alternatives for computer users. You can help the Bad Vista Campaign, one way is to create web banners, logos or badges, see the site for details. Last week some record labels started offering MP3s free of DRM (as reported by ArsTechnica, < ahref="http://www.msnbc.msn.com/id/16081654/" target="new">MSNBS (from the AP) and also engadget and others. EMI is selling some music on Yahoo Music for 99 cents without DRM. The release is limited in scope and is being billed as an experiment to test the waters of demand. Neil has been joined by hundred of other so far. If you live in the UK or know folks who do, please sign the petition or spread the word! Newseek ran an article this week on DRM and the growing anti DRM movement that our efforts have been instrumental in over the last few months. Now, an increasingly vocal grassroots resistance to DRM is cropping up. 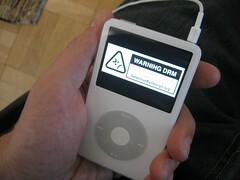 An anti-DRM campaign called “Defective by Design,” which is organized by the Free Software Foundation, has 15,000 registered members; the Electronic Frontier Foundation argues that DRM places limits on “your ability to make lawful use of the music you purchase.” Web sites like stopdrmnow.org and digitalfreedom.org have been launched “to protect individuals’ right to use new digital technologies” and urge boycotts on DRM-tagged content. David Berlind, executive editor of tech trade journal ZDNet, coined his own term for DRM: “Content Restriction, Annulment and Protection.” (Figure out the acronym). This week as the Sony Playstation 3 went on sale in the US, people have been beaten, stabbed and shot over the new DRM laden gaming console! While we can understand how people might get mad when they find out about all the Digital Restrictions technology built into the PS3 (which features a Blu-Ray player) the idea that people are assaulting others to get their hands on these machines is pretty crazy! Last night, I and three other DefectiveByDesign members from Seattle met up for a dinner and a beer and then headed over to the launch of the Zune at the War Room on Capital Hill. This being a Microsoft town, I expected a huge crowd, even if it was just Microsofties. We were surprised by the turnout, maybe 150 people waiting in a line snaking around the corner for the doors to open. Almost all were MS people, but we talked to them none the less. The responses were interesting ranging from disgust with out message, to bemusement to outright support. The Zune is about to find its way onto store shelves. 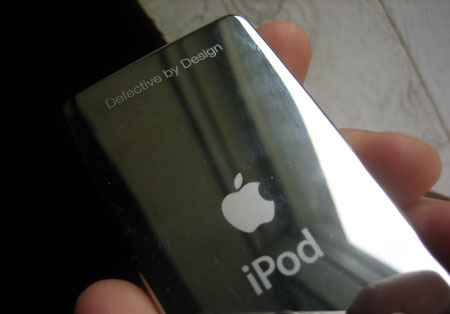 You can support DefectiveByDesign and show others that the Zune is Defective By Design by buying a shirt. There are other shirts available for sale. [img_assist|nid=849|title=DRM make me sad|desc=|link=none|align=left|width=222|height=240]With more than 5000 names added to the Bono petition, we decided it was time to take a look at some of the 1700+ messages that signers have left for the U2 front man. What is interesting is how many signers made the connection that digital restrictions on published works and technology will effect development and cultural equality. A selection of messages are posted below. "Bono, in the same way that the pharmaceutical companies use patents to restrict the poor from getting access to important medicines, so DRM will be used to restrict access to knowledge. At the moment DRM appears to be about music and movies, but within a few years we will see that this was just the beginning. You have the opportunity to help us stop this now." FreeCulture.org just announced the winners of the Down With DRM Video Contest. Electronic Frontier Foundation's report "Who Killed the TiVoToGo?" which details how Big Media and Cable companies forced TiVo to remove the TiVo To Go service from the new TiVo Series 3 HD. Digg DRM killed the TiVoToGo! October 3rd, Day Against DRM was a huge success - thank you to the thousands of people who took part in actions around the globe, both big and small, to spread the word about the dangers of DRM. Thousands of emails were sent from the DefectiveByDesign site to friends and relatives warning them about DRM. We distributed one hundred and fifty thousand stickers, and you used them in more than two hundred organized meet-ups to get the message out. The reports from the protests outside the flagship Apple stores in London and New York showed people were having a lot of fun. Some of you got dressed up in Hazmat suits and educated shoppers and commuters, others blogged about anti-DRM activities, many submitted amazing photos. In Paris StopDRM.info activists took it to another level and handed themselves in to police for breaking French DRM laws. Our friends at Free Culture ran a video competition that resulted in some truly wonderful submissions, and more than 80,000 people have viewed the winning submissions!